This study investigates the mechanisms of epitaxial development and functional properties of oxide thin films (Ce0.9Zr0.1O2−y, LaNiO3, and Ba0.8Sr0.2TiO3) grown on single crystal substrates (Y2O3:ZrO2, LaAlO3, and SrTiO3) by the chemical solution deposition approach. Rapid thermal annealing furnaces are very powerful tools in this study providing valuable information of the early stages of nucleation, the kinetics of epitaxial film growth, and the coarsening of nanocrystalline phases. Advanced transmission electron microscopies, X-ray diffraction, and atomic force microscopy are employed to investigate the film microstructure and morphology, microstrain relaxation, and epitaxial crystallization. This study demonstrates that the isothermal evolution toward epitaxial film growth follows a self-limited process driven by atomic diffusion, and surface and interface energy minimization. All investigated oxides experience a transformation from the polycrystalline to the epitaxial phase. This study unequivocally evidences that the film thickness highly influences the epitaxial crystallization rate due to the competition between heterogeneous and homogeneous nucleation barriers and the fast coarsening of polycrystalline grains as compared to epitaxial growth. The investigated films possess good functional properties, and this study successfully confirms an improvement at long annealing times that can be correlated with grain boundary healing processes. 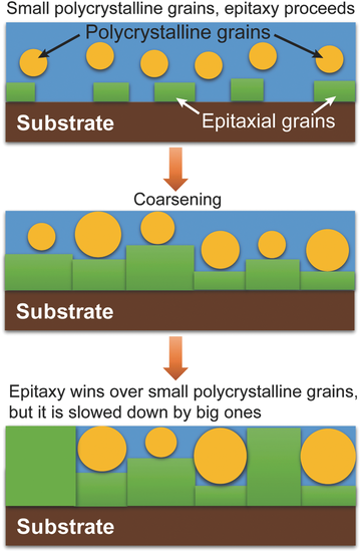 Thick epitaxial films can be crystallized by growing sequential individual epitaxial layers.